RICHARDSON - An East Texas State University football standout is among two athletes selected to the 2012 Lone Star Conference Hall of Honor class. Autry Beamon remains the only player in Lions history to be named a four-time first team All-LSC selection, earning the honor in each of his four seasons at defensive back. The Terrell native continues to hold multiple records to this day. Beamon joins Delloreen Ennis-London of Abilene Christian track & field fame as this year’s inductees. “Autry and Delloreen are most deserving of this high honor. Today in the Lone Star Conference we talk of how the league has such rich tradition and how we are committed to being the very best at everything we do. Certainly Autry and Delloreen contributed greatly to those ideals,” said LSC Commissioner Stan Wagnon. According to the Lone Star Conference, Beamon was a three-time Associated Press All-American, earning first team honors in 1973, while being named a four-time NAIA All-American, including first team recognition in 1973 and 1974. He concluded his career with 30 interceptions, which ranks first all-time in school history as well as among the LSC leaders, while his 535 interception return yards remains a conference career record. Beamon also holds the LSC record for interception return yardage in a single game (122) and season (318). During his four seasons, Beamon helped lead the Lions to the conference championship in 1972, and played a critical role in helping East Texas State to the 1972 NAIA national championship. Following his playing days, Beamon was drafted by the Minnesota Vikings and went on to play seven seasons in the NFL, suiting up for the Seattle Seahawks and Cleveland Browns as well. Beamon played in 100 career NFL games and tallied 13 interceptions for 132 yards, including a career-best six interceptions for the Seahawks in 1977. Beamon also played in Super Bowl XI at the Rose Bowl with the Vikings following the 1976 season. Beamon was inducted into the Texas A&M University-Commerce Athletic Hall of Fame in 1985 and the Texas Black Sports Hall of Fame in 2010. 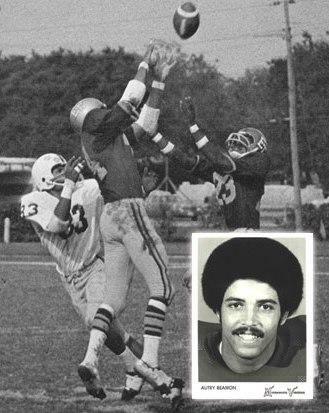 He was a teammate of LSC Hall of Honor inductee Harvey Martin as the two anchored the Lions’ defensive unit during the 1972 national championship run. Beamon and Ennis-London will receive the LSC’s signature Hall of Honor award, a 15-inch custom-sculpted eagle figurine mounted on a cherry wood base. The awards are to be presented this fall with ceremonies at each recipient’s institution. The LSC Hall of Honor recognizes outstanding individuals who have brought pride and honor to the conference through their contributions as an athlete or who have demonstrated a long-term commitment to the betterment of the conference as a coach or administrator.